When a band takes its name from a Microphones song, it’s fair game to expect hopeless toiling in love metaphors, jumpy explorative arrangements, and, above all, musical cataracts in the form of depression. Phil Elverum’s “Antlers,” a lo-fi folk recording that fades out with a solid minute of classical piano, was an apt source of inspiration for The Antlers seeing as their first two albums, 2006’s Uprooted and 2007’s In The Attic of the Universe, fell in line with that isolated, bed-ridden sound. But once frontman Peter Silberman picked up multi-instrumentalist Darby Cicci and drummer Michael Lerner, his solo effort took to its knees as a trio and began digging deeper into genres. Now, with dirt drying under their fingernails, they have hit water. The “sad” tag has been pinned to The Antlers since day one; rightfully so considering Hospice was Bummer Fest 2009. With a terminally-ill patient and a hospice worker retelling an emotionally abusive relationship—and with contributing vocals from the modern queen of sorrow, Sharon Van Etten—critics couldn’t help but fawn over the gloom. 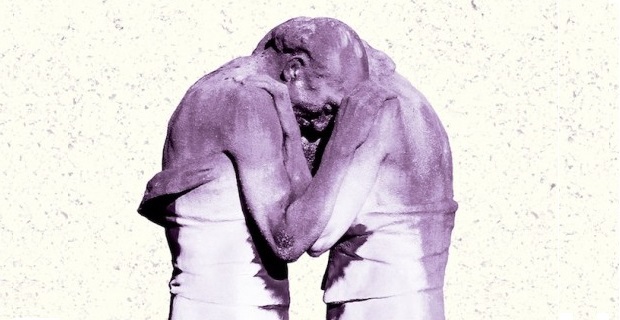 Yet despite critics’ stubborn persistence, The Antlers can’t be pegged by a single genre. Their sound continues to evolve, bringing its listeners forward into an unfamiliar but intriguing territory, from dark folk to lush, orchestral rock to Burst Apart’s biting layers. So it’s with great irony that Familiars, a slow-motion dance that ditches upbeat hooks for elusive jazz and ambient waves, is the first to come as a surprise. Opener “Palace” is the most tongue-in-cheek of the album’s tracks. The keyboard bops around like a preteen’s first penned ballad, but Cicci’s horns keep it from going under, asking us to stick it out if only for that soulful brass. Once “Doppelganger” begins with its eerie, creeping bassline and Silberman’s vocals that lure us into a bottomless ocean, one thing is clear: patience is well rewarded on Familiars. It’s filled with effect-laden guitar, sentimental trumpet crescendos, and sparsely-hit drums. And while seven-minute “Doppelganger” introduces us to this new drugged-out space, it’s tracks like “Revisited” and “Surrender” that keep us floating along as we adjust. On first listen, Familiars is much less involved than The Antlers’ last efforts. It rings in like a combination of the Undersea EP’s heavy reverbs and the Cold War EP’s frigid detachment without any of the sharp stab. If tweezers are taken to each track, however, the thin layers can be pulled back to reveal, at their center, the same weight of Silberman’s sadness that we’re accustom to. For the first time, he’s simultaneously using sonic space to explain half of his sorrow while also using that space to overcome it. It’s a classic struggle of altered identity and how it shifts over the years. “In the hotel, I can’t remember how the past felt, but in a strange bed, I keep sleeping with my past self,” he sings on “Hotel,” the only track on the album that sounds like it could have been a Burst Apart B-side. Unfortunately, the gaps left by his detachment on the rest of the record may be too hollow for returning fans to find comfort. Nevertheless, The Antlers’ decisiveness in going headstrong into a new genre is worth applauding, especially after climbing the record label stairs from Fall to Frenchkiss to Anti-. Jazz-tinged guitar solos grace the songs beautifully, most notably on the previously mentioned “Hotel,” nostalgia-soaked, father-daughter dance “Parade,” and the soulful, ship at sea call “Director.” They’re simple but emotive, the way the best solos seem to be. The Antlers find themselves wrapped up in this style the most during “Intruders.” Behind the faux image of serenity lays anxious fear: “When my double scales the wall, I’ll know exactly where he’s landing and I’ll surprise him / Then when he’s captured with his hands bound, I beg for answers to all my questions.” Silberman finds himself wrestling his previous self, nose to nose, while the world around him continues in a drawn out haze of pleasantries, this time taking form in slick guitar lines and horns sighs. It’s the most neatly tied of the tracks, but the full composition of “Refuge,” especially in its closing coda, is a contender as well. In the months leading up to Familiars’ release, The Antlers’ Instagram was filled with shots of gorgeous hiking trails, mountain overlooks, and pebbly shores. The pristine images, many of which had an encompassing tranquility to them, were missing location tags, leaving the dozen or so commenters unaware of where the shots were taken. These images feel more true to the album’s heart than the cover’s lavender embraced statues. Familiars brings you on a meditative walk to confront your mind’s demons, but when we find ourselves walking back into the comfort of our homes to reflect on that hike, we find it wasn’t a remarkable route. Even most eventful run-ins blend together despite gorgeous solos and warm horns. So when the urge to hike through confrontations rises again and it’s up to you which way to go, don’t be surprised if the idea of taking a different route is tempting.